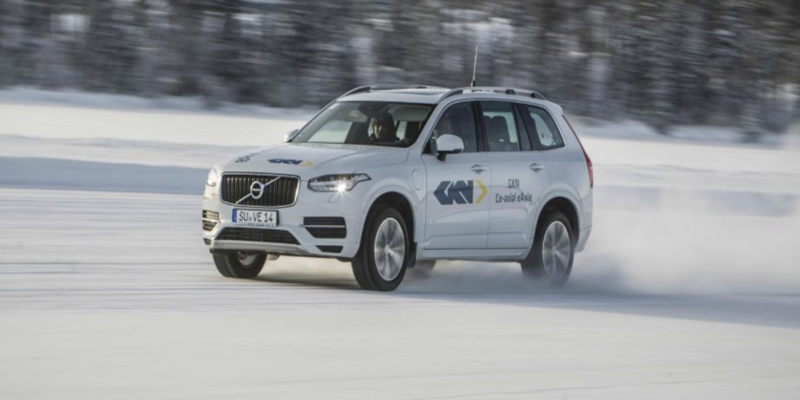 2018 sees GKN Driveline celebrate a major anniversary of its extreme cold-weather testing programs. Originally a small operation run from a single garage over the course of a few weeks, 30 years later the event, known as ‘Wintertest’ is a major multi-month event. Every year a full team of engineers arrives in Scandinavia with up to 20 cars, with the intent of putting the latest driveline systems through their paces. Located 60 miles (100km) from the Arctic Circle, GKN’s test track facility in Arjeplog, Sweden, provides a hostile driving environment that enables engineers to evaluate the impact of various technologies on vehicle performance at temperatures as low as -40°C. This severe climate enables GKN’s team of engineers to analyze and fine-tune systems far quicker than if tested in normal road and weather conditions, according to the company. The engineers have access to three test courses, all located on a frozen lake: a 250m-diameter circle, a 0.9-mile (1.5km) vehicle dynamics pad and a winding course of about 1.9 miles (3km). All three courses are used for assessing the safety, durability and performance of its driveline systems, and determining driving stability and vehicle behavior. During GKN’s first Wintertest in 1998, the driveline systems being tested included a range of viscous-fluid couplings for all-wheel drive (AWD) and limited-slip differential (LSD) functions. The evaluation and development led to technologies such as the first fast-rotating hang-on AWD drivetrain and cutting-edge LSD systems. Since then, the testing process has advanced from hand-written records and mechanical adjustments to real-time data and on-the-fly software tuning. Subsequent technologies developed at Wintertest have included Electronic Torque Manager (ETM), an active eLSD application that leverages advanced traction and brake control systems; and the ETM eLSD, which now appears on a wide range of high-performance sports cars and premium vehicles. According to GKN, it is developing systems with an even keener focus on traction and lateral dynamics, which makes extreme cold-weather testing on low-friction surfaces an even more critical element of evaluation. This has also resulted in the development of more detailed torque measurement and instrumentation processes.